On this high-end deck, a cable rail was chosen to preserve the view. 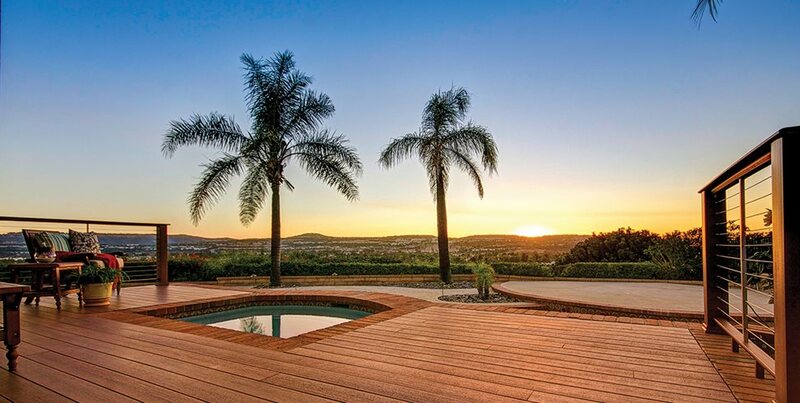 The decking material is TimberTech’s Earthwood Evolutions in Pacific Rosewood color. A larger budget allows perks such as an octagon shape, diagonal deck boards, built-in benches, composite railing and deck lighting incorporated into the post caps. Composite railing by AZEK adds a finishing touch to this pressure-treated deck. Angled, wrap-around stairs bring beauty and function to this deck. This project cost around $20K. 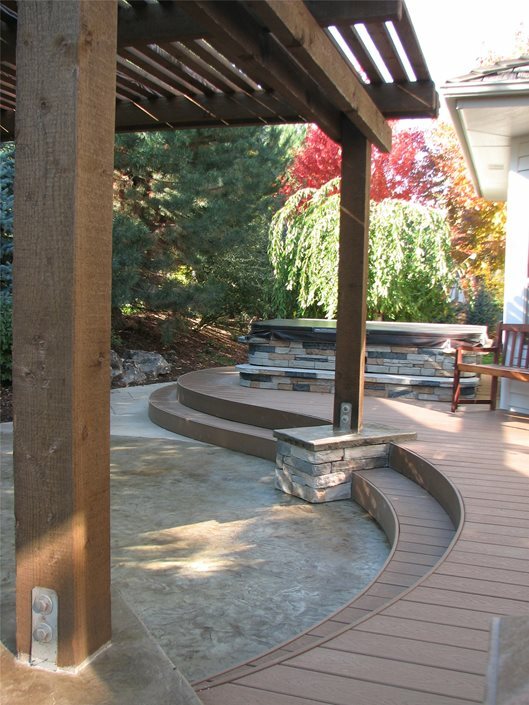 This curving deck was made of Trex decking in Woodland Brown, and cost about $23 per square foot. 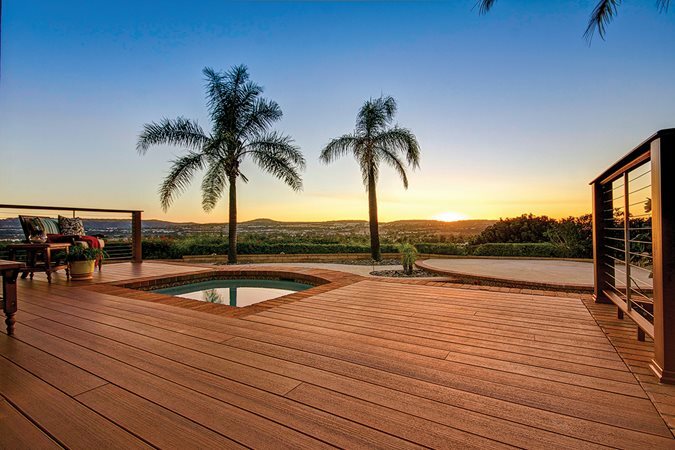 The cost of your deck is affected by a number of considerations including the materials you choose, any unusual shapes or patterns on your deck, and extra accessories such as benches, storage, railings and more. 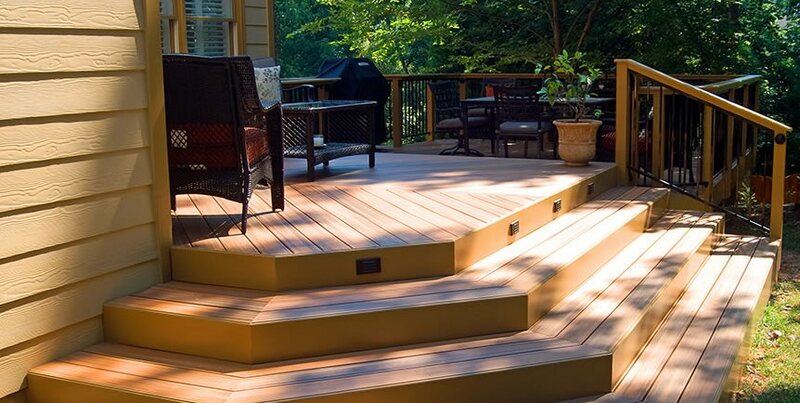 Here are some of the things you’ll need to keep in mind when budgeting for your deck project. More than anything else, the materials you choose affect the cost of your deck. However, you’ll want to look at more than just the initial cost, because one of the main differences between high-end and low-end materials is in their longevity. 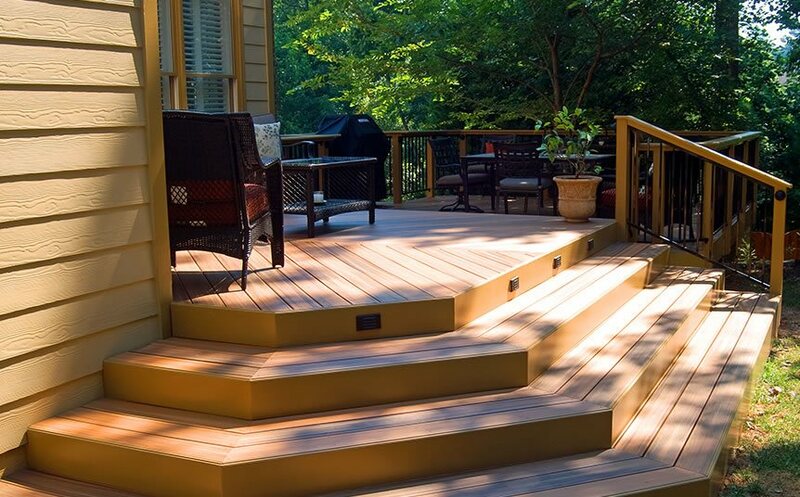 Here’s what you need to know about the most common decking materials. - Tropical hardwoods such as ipe, cumaru, and tigerwood are a popular high-end option because they last 30-50 years, even in harsh coastal conditions. However, the wood is so dense that it requires special tools and more labor to install. In addition, unless you want the wood to weather to a pale gray, you’ll need to oil the deck every one to two years. 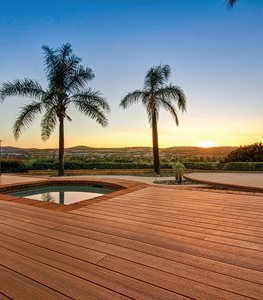 An ipe deck can cost $23-30 per square foot. 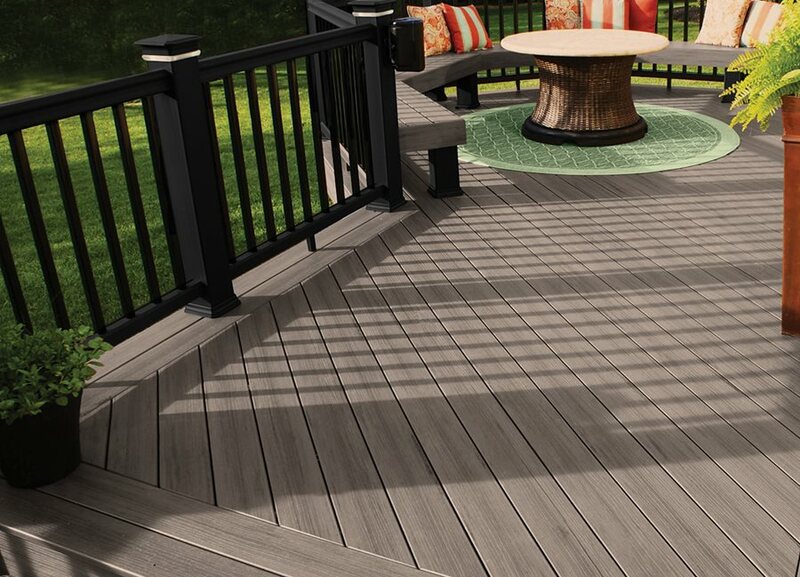 - The old style of composite decking is a blend of wood fiber and plastic which has a brushed, matte surface. While it requires periodic cleaning to look good, it costs less than newer types of capped composite which need little care. Most composite and capped composite products are warrantied against fading or other defects for 25 years. - Capped composite has an exterior layer of PVC surrounding a composite core, and is available in a variety of colors and textures to suit any style. 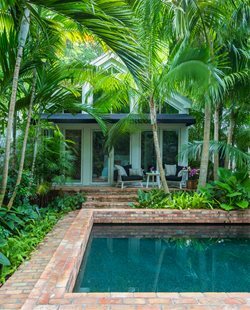 The advantage of using capped composite is that you can get the look of a tropical hardwood, without needing to do any ongoing maintenance to keep it from fading. 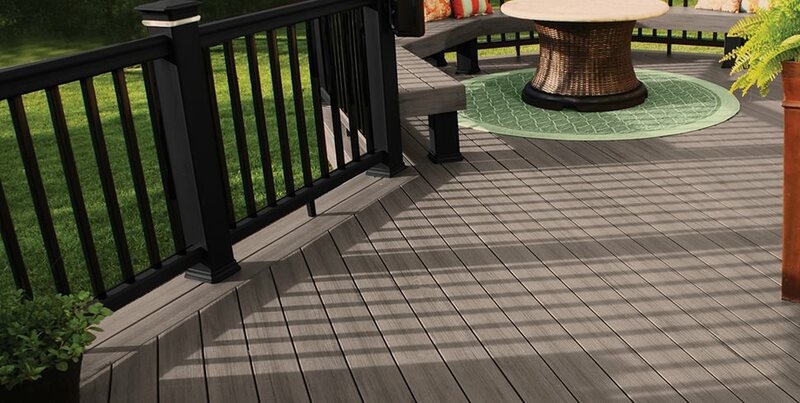 A capped composite deck can cost $20-28 per square foot. - Cedar or redwood are good mid-range options in that they cost less than tropical hardwoods or composite, yet last 15 to 20 years. However, these materials still need regular cleaning and staining. “Cedar’s a cheaper option, but it still has all the maintenance requirements of wood,” says Baron Biedenweg of Archadeck of Fort Wayne in Ft. Wayne, IN. For that reason, most of Biedenweg’s clients choose capped composite instead. - While pressure-treated wood varies in quality, it’s a workable option for those on a budget, costing only $16-18 per square foot. 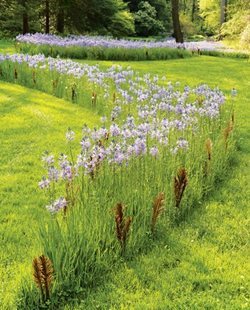 The main downsides are a lack of longevity and the need for maintenance. 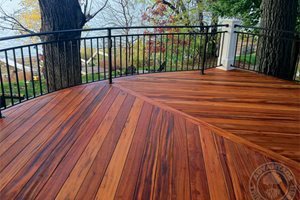 A pressure-treated deck will only last 10 to 15 years, and requires cleaning, sanding, and staining every one to two years. There are number of options for railings ranging from wood, composite, aluminum or steel, cable rail, or tempered glass panels. All are safe if built to code, but they vary dramatically in price as well as looks. 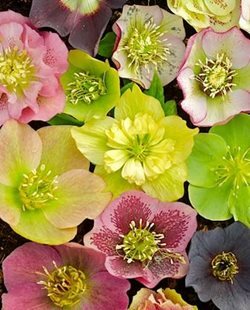 Here are a few options to consider. - The cheapest rail is no rail at all. 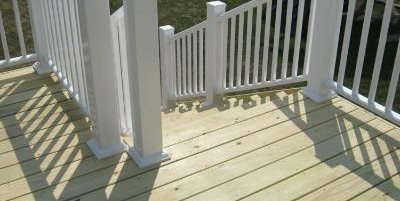 Your local codes will vary, but usually decks that are less than 30 inches off the ground will be not be required to have a rail for safety. 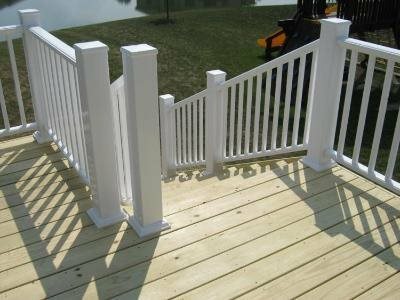 - Most building supply stores carry precut wooden pickets that can be used to create an inexpensive railing system for a wooden deck. If you have a little room in the budget, Biedenweg suggests adding a drinks rail with a flat top so guests can set their drinks down as they socialize. - You can buy pre-manufactured pickets, railings and other elements made from aluminum, steel and iron. It’s also possible to create custom panels or finials out of metal. Different types of metal vary in price, but aluminum railings are similar in price or a bit less than composite. 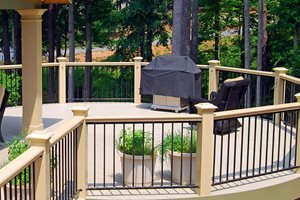 - Capped composite railing such as RadianceRail from TimberTech is a mid-range option which can be matched to any style of deck. It’s easy to clean and long-lasting, requiring little maintenance to look good. Composite railing ranges from $15-$30 per linear foot before installation costs. - Panels of tempered glass are another alternative to traditional pickets. Tempered glass doesn’t impede the view, is perfectly safe for properties with small children, and has the added benefit of blocking wind. Cost-wise, tempered glass is similar to cable rail. 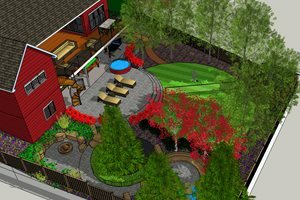 Many factors go into designing a deck that’s right for your budget, such as the size of the deck, materials chosen, design details as well as extras such as fire pits, spas, or shade structures. We’ve talked with the professionals to find out the differences between projects with a low budget, mid-range budget, or a budget that allows for all of the amenities. 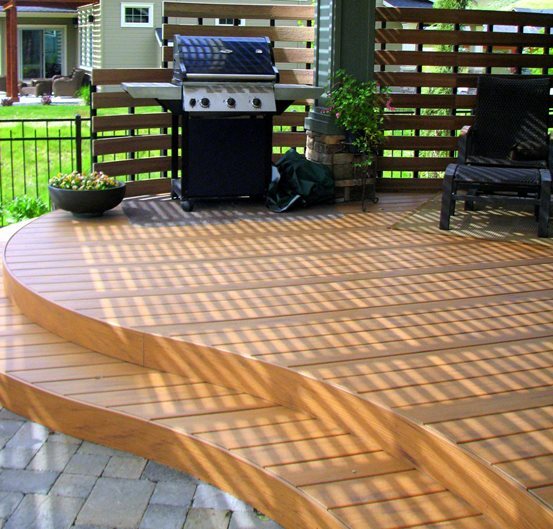 Overall, inexpensive decks are characterized by having a small size and straightforward design. They also need more ongoing care to look good, and may not last as long as a high-end deck. 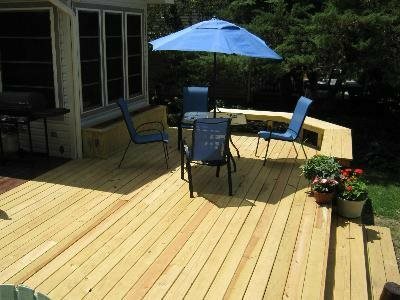 However, even a low-budget deck can make a huge difference in how much you enjoy your outdoor space. 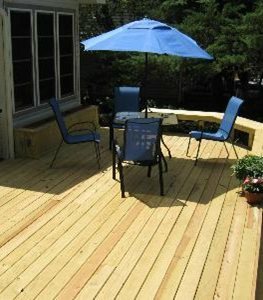 A low-budget deck is made of pressure-treated wood, cedar or redwood. The design will be a simple square or rectangle without any curves or patterns in the boards. It will often last 10 to 20 years, depending on the materials used and on how well the deck is maintained. Wooden decks must be cleaned every one to two years, then stained, painted, or sealed. No railing will be used, or an inexpensive wooden railing can be chosen where one is required to meet code. The heads of screws will be visible along each deck board. Steps will be plain rather than angled or wrapped around. No additional amenities such as built-in benches or storage, lighting, shade structures, or a hot tub are included. For a little more money, you get a big bump in the quality of the materials available. Biedenweg says that as a rule of thumb, making the move from pressure-treated wood to capped composite “will more or less double the cost of the project.” Yet this is the option most of his clients select due to the ease of maintenance, durability, and beauty. A mid-range deck is usually constructed from capped composite. More options in terms of using curved shapes for the deck, or creating patterns with the deck boards. Capped composite boards are warrantied for 25 years against fading or warping. Hidden fasteners keep the surface of your deck unblemished. A railing may be used as an architectural element, even if it’s not required for code. Minimal lighting may be included on stair risers, post caps, or other locations to improve safety and ambience. Wraparound stairs or angled stairs are another upgrade available, depending on budget. Biedenweg points out that one of the main advantages of having a generous budget for your deck is that you can include all of the amenities. While mid-range decks only have one or two special touches, high-end decks will have a number of custom built-ins and other additions. Your contractor could construct a pergola over part of the deck, create built-in benches, planters or storage boxes, or even add a fire pit to make the outdoors more inviting. Elements that require structural support are another feature of high-end decks. Parks builds inlaid octagons or other shapes to create or enhance an activity zone. “It defines the space and creates an inviting look,” he says. Inlaid octagons or other bump-outs add to the cost because they need to be supported with additional posts or framework underneath. 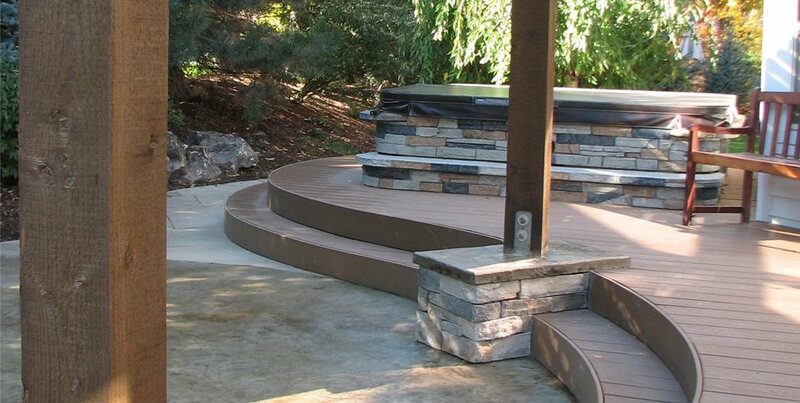 Pool or spa decks also require additional structural support. ‘It’s almost like building two decks, because you need to create the support structure to hold the spa, before building a deck around it,” Biedenweg says. “A swim spa can weigh 16,000 pounds. We start by building a deck system to support it with oversized footers, beams and rafters, and we install that support deck first. Then we build an entertainment deck around it,” he explains. A high-end deck will usually be constructed of a tropical hardwood such as ipe, or capped composite materials. Premium decks will last 25-50 years, depending on the materials chosen. Cable rail or tempered glass panels which preserve the view and visually disappear into the landscape are high-end railing options. Can add custom built-ins such as benches, storage boxes, planters and more. 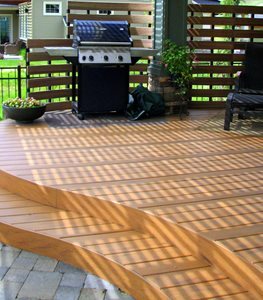 Use a hidden fastener system for a smooth deck surface. A full lighting system can be added to extend your deck’s usefulness into the evening. Inlaid octagons and other shapes that require additional structural support may be used, and your contractor can create interest by setting boards diagonally or in patterns. A swimming pool or a spa deck is another premium option.